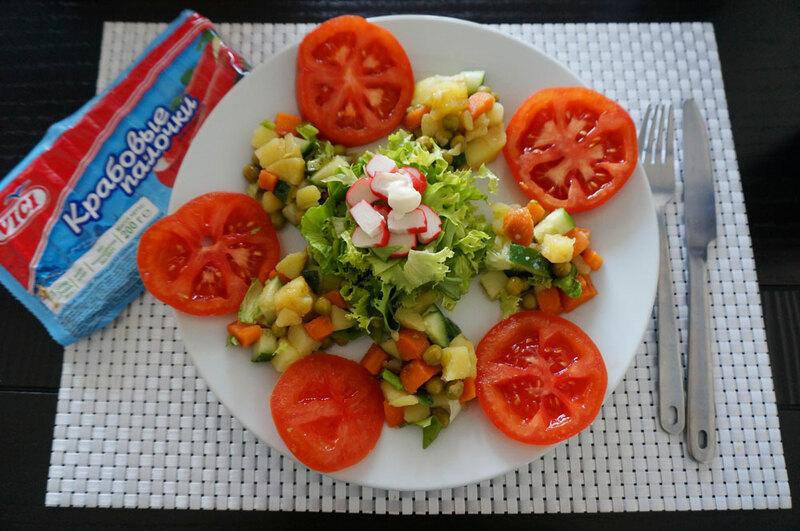 Crab stick salad, which ranks in popularity among Russians up there with olivier and vinaigrette, doesn’t actually involve any real crab, but that’s not because they weren’t available in the Soviet Union. It’s hard to believe it, but there is a Soviet salad that can match olivier and vinaigrette in popularity — and it might come as a surprise: crab stick salad. I remember it always being on the table when I was a child — whether it was for a special occasion or just a regular family lunch. It’s even there now, although Granny has to make a separate batch for my husband — crab stick salad minus the crab stick, as he can’t eat seafood. When I was in primary school, I remember getting a packet of crab sticks, unwrapping them one by one and eating the whole pack. Those along with “fish fingers” were among my favorite treats. It was much later that I learned there was no crab meat in the crab stick — they’re just colored to look like crab meat. I guess it’s just one of those things you learn with age — your parents are not perfect, boiled condensed milk is not the world’s finest dessert, and there’s no crab in the crab sticks. I was still happy to discover a “salad with crab” in the Book — although I’m pretty sure I’ll have to substitute “crab” with crab sticks as crabs haven’t developed a habit of living around Moscow or Tbilisi, and I haven’t developed a hugely thick wallet. It also looks like the recipe from the book will be quite different from the salad I grew up with — it has boiled turnip, potatoes and carrots among other ingredients. The recipe Granny shared with me has boiled rice, corn, bell pepper and boiled eggs. And of course absolutely no crab meat, as opposed to the book’s recipe. The recipe in the Book requires quite an elaborate way of serving — I must admit, I had to reread it a few times to understand: arrange the lettuce in the middle, put the crab on top, then arrange the other vegetables around like “bouquets” and drizzle the dressing over it. It was in the middle of the night, long after the salad had been eaten, when I realized what the Book meant by “bouquets.” The vegetables needed to be cut in smaller and neater circles than mine had been. I have mixed feelings about this revelation — glad I had it, but wishing I’d had it sooner! Unfortunately the Book’s recipe can’t match the salad from my childhood — I don’t think the ingredients work well together, although crab sticks make up for it. So what was the need to create this incredibly strange, if not completely deceptive product using cod fish meat instead of crab? Crab must have been one of those “dream” foods, like pineapples, oranges and actually most fruit besides apples. A few years ago, a group of young entrepreneurs opened a café in Moscow called “Crabs are coming” serving Kamchatka crab at reasonable prices. The news went all around town, as Kamchatka and crab both sound very expensive. It’s a very popular place — maybe it works because the cafe only has about 3 tables! If crab can be affordable does it mean there’ll be no room for cod fish and God knows what rolled up in red and white sticks anymore? And actually, will real crab taste as good as the sticks we grew up on? I’m not sure, I think I might be allergic to real thing. Lucky the sticks are delicious! Cut the prepared vegetables into small cubes and the tomatoes into circles. To serve, cut the lettuce, leaving a few leaves whole for decoration, and put in a salad bowl. Around the lettuce, arrange the vegetables individual bouquets. On the center of the lettuce, arrange the crab meat. Lightly salt and pepper the vegetables and pour over the salad a dressing of oil and vinegar and juice from the crab. Then pour the mayonnaise sauce over the top and decorate with lettuce leaves.